Advanced Network Solutions [Max Sadler] landed on the Nashville Business Journal’s list of Top Technology Employers. David Waddell [Waddell and Associates] was quoted in a Wall Street Journal article about investors fears of a declining stock market. The Nashville Post reported that Launch Tennessee [Charlie Brock] became one of 22 state and local economic agencies, business development centers, colleges and universities to receive the FAST grant from the U.S. Small Business Administration. Charlie’s column for the Tennessean focused on the state’s Accelerator Program. Advance Financial [Michael Hodges] was voted Best Place to Cash a Check in Maury County. The Columbia Daily Herald had the story. BlueCross BlueShield of Tennessee will be opening its first retail store in Nashville, signaling another change in the insurance industry. Alex Tolbert [Bernard Health] discussed how the move affects health care consumers in his latest Tennessean column. Mark Scrivner [SnapShot Interactive] spoke to the Nashville Business Journal about how his company is preparing for large-scale growth. The Nashville Scene covered Edley’s [Will Newman] expansion at the 12 South location. The restaurant added over 900 square feet of space and 40 seats. Ben Hanback’s [Regions Insurance] column for the Tennessean focused on how to build trust in business. Corsair [Darek Bell] was featured on the cover of Beverage World Magazine and chosen as one of the breakout brands of 2014. TIME Magazine mentioned The Patterson House [Ben Goldberg] in its feature on 7 Great American Vacation Spots. Julie May’s [bytes of knowledge] column for the Tennessean introduced a new marketing concept for retailers called Beacons. Nick Palladino of Moo Creative [John Huber] wrote a guest blog for the Nashville Business Journal on four tips for working with freelancers. J.J. Rosen [Atiba] wrote his Tennessean column on the joining of technology and sports. Snips Magazine featured Comfort Supply [Clay Blevins] in an article about indoor air quality products. James Fields [Concept Technology] focused his Tennessean column on the downfall of Windows 8. Southern Living’s style issue focused on the best of Nashville and included a feature on “Nashville’s New Guard” with Benjamin and Max Goldberg [Strategic Hospitality]. Architectural Digest’s “Daily AG” highlighted Pinewood Social as Nashville’s most stylish new eatery and The Huffington Post featured an interview with Chef Trevor Moran of The Catbird Seat. USA Today profiled the Nashville food scene and released its picks for the best new restaurants in Music City. The list included Pinewood Social, The Catbird Seat [Ben Goldberg] and Josephine [Miranda Whitcomb Pontes]. The Tennessean‘s Realtor Spotlight featured Village Real Estate Services [Mark Deutschmann] realtor Kelly Dougherty. Andy Bailey [Petra] was the featured speaker at the CRS 2014 Focus and Prioritize To Get S*** Done session. Country Air Check, a leading music industry publication, wrote a story on the event. Andy’s Tennessean column was also published this week and focused on bi-weekly performance reviews. The Tennessean wrote an article on the stats of the new Omni Hotel, which include 27,143 cups of coffee served at Bongo Java [Bob Bernstein]. Julie May [bytes of knowledge] was mentioned in a Nashville Ledger article about the local tech boom and focused her Tennessean column on how to prepare for a technology disaster. BusinessChatt released the speaker line-up for the 2014 Southland Conference and featured a quote from Charlie Brock [Launch Tennessee] about this year’s event. Alex Tolbert [Bernard Health] penned his column for the Tennessean on why law firms are the first to adopt individual health care plans under the new health care law. The Nashville Business Journal’s cover story included input from local health care experts, including Alex Tolbert [Bernard Health] and Dan Hogan [Medalogix]. Ben Hanback’s [Regions Insurance] Tennessean column focused on the value of old school etiquette in today’s business world. David Waddell’s [Waddell and Associates] column in the Memphis Daily News focused on creating a concentrated portfolio strategy. Music City Tents and Events [Joe Freedman, JT Terrell] sold its headquarters to a Missouri-based family trust and has signed a lease to become a tenant of the building. The Tennessean covered the sale of the property. Here’s the rundown for the past week (and a bit)! The “Entrepreneur Briefs” section of the Tennessean featured EO Nashville’s “Second in Command” program. Ben Hanback [Regions Insurance] wrote his column for the Tennessean about healthy competition, based on his experience with IronTribe Fitness. Deep South magazine featured an article on Nashville’s coffee shops and highlighted Bongo Java and Fido [Bob Bernstein] as two of the best. Julie May [bytes of knowledge] tacked the topic of “cowboy coders” in her most recent Tennessean column. In addition, The Nashville Business Journal featured Julie in a Women of Influence true or false article that asked: Do female executives have different traits than men? Julie also wrote another column for Young Upstarts about tracking your progress in an IT project. Julie May and Debbie Gordon [S3 Asset Management] were each honored as Women of Influence by The Nashville Business Journal. J.J. Rosen’s [Atiba] Tennessean column suggested that it might be time to make the switch from a laptop to a tablet. The Nashville Post wrote an article on a grant from the Blackstone Charitable Foundation that was given to Launch Tennessee [Charlie Brock]. The grant will allow the organization to launch a pilot program that will allow universities to help support existing accelerators. The story was also written up in the Tennessean, Memphis Business Journal, Knoxville News Sentinel, Chattanoogan and Chattagnooga Times Free Press. Charlie also focused his Tennessean column on the grant. Corsair [Darek Bell] was listed in the top 50 Craft Distilleries on Thrillist.com and Derek was quoted in a Fortune Magazine article about the bourbon boom. The Nashville Scene wrote a review of Miranda Whitcomb Pontes’ restaurant Josephine, noting that the new venture takes 12South dining up another notch. Dan Hogan [Medalogix] is part of the TEDx Nashville 2014 lineup, which is scheduled for March 22. The Nashville Post and the Nashville Business Journal reported on the announcement. Michael Brody-Waite [InQuicker] was quoted in a Nashville Business Journal article about preparing for growth in Nashville. The Tennessean offered a glowing review of Two Ten Jack‘s [Patrick Burke] grand opening. Alex Tolbert’s [Bernard Health] Tennessean column proved that no matter your level of education, picking a health care plan is tricky. Brand Imaging Group [Scott Snoyer] created a Winter Wonderland in the Bridgestone Area Rehearsal Hall for the Nashville Predators two-week Olympics break. The event, which is free and open to the public, was covered by the Tennessean. The Nashville Scene interviewed Wayne McGregor about the dance he created for Oz Nashville‘s [Tim Ozgener] inaugural performance. Oz was also written up in the February edition of Nashville Lifestyles. The Silicon Valley Business Journal featured Populr.me [Nicholas Holland] in an article about the top trending startups at 500 Startups. David Waddell [Waddell and Associates] focused his Memphis Daily News column on what the federal reserve can, and cannot, control. Tech executives from across Nashville, including Arnie Malham [CJ Advertising], Clint Smith [Emma] and Alex Tolbert [Bernard Health] will be joining Julie May at a bytes of knowledge-sponsored panel event next week. The Nashville Business Journal has the event information and registration. The Tennessean reported on Bongo Java‘s [Bob Bernstein] birthday makeover. The Belmont location is getting a new deck, as well as an expanded front entrance, complete with glass garage doors that will be opened this summer. Kings Of Leon named Pinewood Social [Ben Goldberg] as one of the new Nashville hotspots they are excited to try in this month’s Nashville Lifestyles. 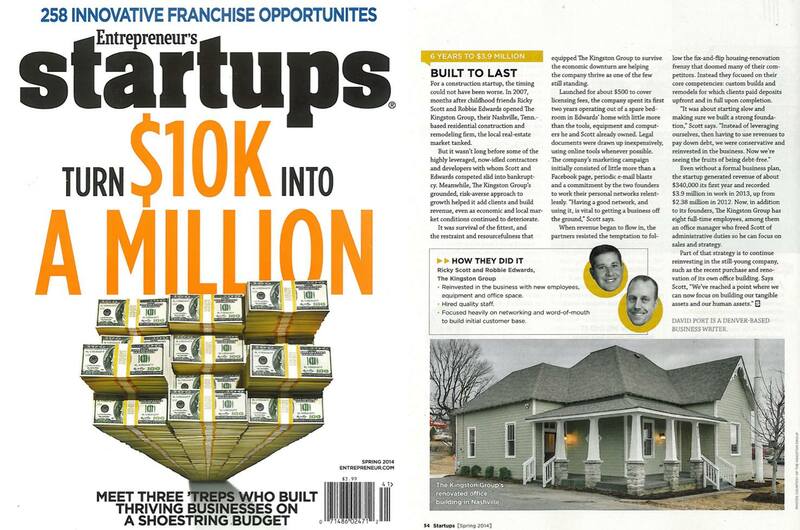 The Goldberg brothers were also featured in an Inc.com article about their “secret sauce” for success. Julie May [bytes of knowledge] focused a Tennessean column on the new digital wallet that could soon make credit cards obsolete, and wrote a second Tennessean column on technology advances in 2014 and what they mean for your privacy. Joe Freedman [Music City Tents & Events] was the focus of Nashville Business Journal’s “Who to Meet” feature. Bell & Associates Construction [Darek Bell] was selected to build the new Sounds baseball stadium, which is scheduled to open in 2015. The Tennessean covered the ballpark’s progress. J.J. Rosen’s [Atiba] Tennessean column focused on the “Gamification” of the workplace. Nicholas Holland’s [Populr.me] experience with 500 Startups in Silicon Valley was the focus of a Tennessean Q&A article. The Nashville Business Journal covered DSi‘s [Tom Turner] expansion to Atlanta in its Nashville Biz Blog. DSi was also featured in a Legal Tech newsletter article about metadata. Mark Deutschmann [Village Real Estate] ranked third in Nashville Business Journal’s list of top real estate agents. A Commercial Appeal article about Memphis’ new guard prominently featured David Waddell [Waddell & Associates] and was picked up by Bloomberg Businessweek. David also penned his Worldly Investor column for The Memphis Daily News on the “Naughty and Nice” economy of 2013. Andy Bailey [Petra] offered advice on how to achieve your 2014 New Year’s resolutions in his Tennessean column. The Nashville Business Journal quoted Chris Redhage [Provider Trust] in its article about buzz words of the year. Chris hopped on the “standing desk” trend and added one to his office. James Fields [Concept Technology] wrote his Tennessean column on the 5 trends in technology in 2014. Concept Technology was also featured in the Nashville Business Journal’s “Buzzwords” for the acronym BYOD (Bring Your Own Device). Miranda Whitcomb Pontes [Josephine] was mentioned in relation to the “Farm-to-table” buzzword for her new restaurant in 12 South that focuses on sustainability. Miranda’s new restaurant Prima, set to open in the Gulch in 2014, is already generating significant buzz, with The Nashville Business Journal reporting on its “25 Most Anticipated Restaurant Openings” ranking by Zagat. In his Tennessean column, Alex Tolbert [Bernard Health] wrote about President Obama’s expected New Year’s resolutions for health care. Bernard Health was highlighted in an Indy Star article about how to navigate Obamacare and the The Tennessean covered the opening of Bernard Health’s Cool Springs retail store. The retail store was also highlighted as the buzzword “consumerism” in the Nashville Business Journal cover story. The Nashville Business Journal featured Dan Hogan [Medalogix] in its ETC. section where he offered a list of his favorite things. John Cook Jr. [Dole Refrigerating Company] was mentioned in a Tennessean article about his daughter, Georgia Cook, who is a young, successful surfer. Ben Hanback [Regions Insurance Group] focused his Tennessean column on setting an example for your business and your peers through good works. Moo Creative Media [John Huber] recently purchased new office space in the Fifth and Main building in East Nashville. The Nashville Post and The Nashville Business Journal covered the story. The Nashville Business Journal penned a story on Barry Smith [Eakin Partners] for their Nashville Biz Blog. Happy holidays! Before you head out of town, take a moment to browse the news of the week. EO Nashville made big news this week with its addition of 23 new members, a 30% jump from last year. The Nashville Business Journal and Nashville Post covered the story and noted that EO Nashville is one of the fastest-growing EO chapter in the world. A few of our members met with Senior Economic Advisors at the White House this week as part of a national summit on the Nation’s economy. The Tennessean covered the event and the Tennessee delegation of business men and women, which included Charlie Brock [LaunchTN], Ben Hanback [The Hanback Group] and John Rowley [Fletcher | Rowley]. Hart Weatherford [Farmington Financial Group] was profiled in the Nashville Business Journal’s 40 Under 40 section. 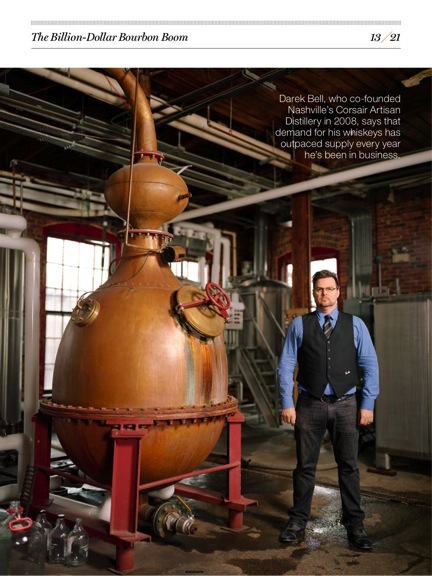 Corsair Artisan [Darek Bell] was prominently featured in the Winter 2013 edition of Artisan Spirit Magazine. Mark Deutschmann [Core Development] was featured in a Nashville Post story about the conversion of Germantown’s Werthan Lofts into condominiums. Barry Smith [Eakin Partners] was quoted in a Nashville Business Journal blog about HCA’s move to the Gulch. SouthernAlpha congratulated Nicholas Holland and the Populr.me team for being ranked 3rd out of the 30 entrepreneurial businesses participating in 500 Startups. Alex Tolbert [Bernard Health] penned a column for the Tennessean that offered his tips for enrolling on Healthcare.gov.